WHY? 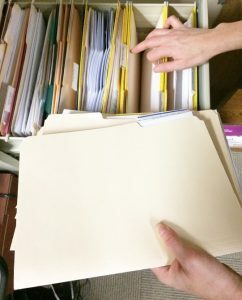 Career-related and business records are among the most difficult things to recover or replace after an emergency. Keeping good records and storing them safely can make a big difference in a disaster recovery. It can also make normal, day-to-day work more efficient and effective. One smaller “quick grab” container that you can easily pick up and take with you in an emergency that contains all the career and business related documents you would need to restart your livelihood after a disaster. Schedule a monthly inventory of the items you’re storing and determine their relevance. Keep your most up-to-date information in this “quick-grab recovery archive,” rotating items out as they become obsolete to your recovery strategy. Getting Your Sh*t Together sells artist management software at www.gyst-ink.com.